I spent the New Year at my in-laws’ home in the Japanese countryside, about two hours by train from Hiroshima. 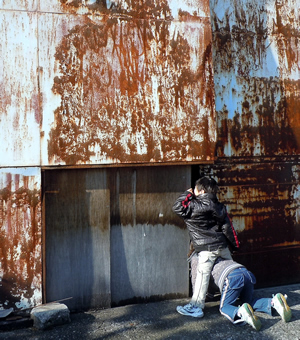 It’s a rural and rustic area, and the older houses—like theirs—even lack flush toilets. Now I admit, I don’t much like the blast of chilly wind a pit toilet sends up in winter. I do, however, enjoy wandering the back roads and trails of the area with Lulu and Roy. The truth is—and this is especially the case at this time of year—the countryside, with its rusty buildings, cracked stone walls, and crumbling gravestones, is a stark and poignant reminder of how relentlessly time passes. 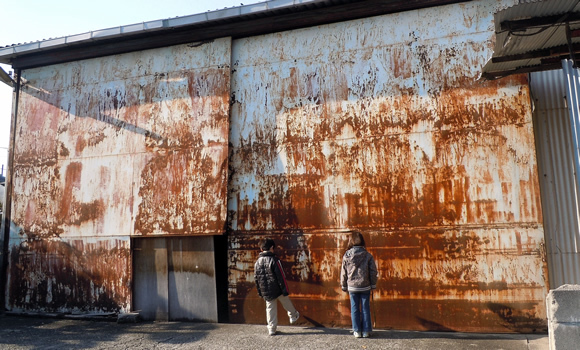 On New Year’s Day we came across this old metal barn, glowing with rust—nature’s contemporary art. In the middle there you can see a black slit, a peephole on the darkness inside. Naturally, the kids wanted a look, and after jostling for position, with neither one able to get a good glimpse, they finally arrived at this admirable solution. I chuckled as I squeezed the shutter, then it hit me hard: my resolution for 2013. None of us knows, of course, what this year holds in store for our lives—in a way, it’s like that black opening in the side of the barn. At the same time, we do have some control over the efforts we make to realize the outcomes we seek, as well as our responses to the results we find dissatisfying. In my case—and here’s my resolution—I’m determined to be more proactive when it comes to my efforts, and more persevering when responding to dissatisfying results. And this includes not only my bilingual ambitions for my kids, but every important pursuit in my life. Not far from my in-laws’ house is an old cemetery that climbs a steep hill through the woods. 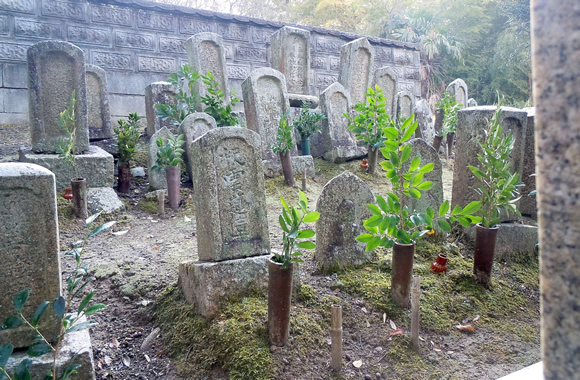 Many of the gravestones, if not already fracturing or falling over, have become so faded that the names can now barely be read. Who lies in these graves? What lives did they lead? What dreams did they pursue? Did they die with those goals fulfilled? One grave holds the remains of Lulu’s and Roy’s great-grandparents. 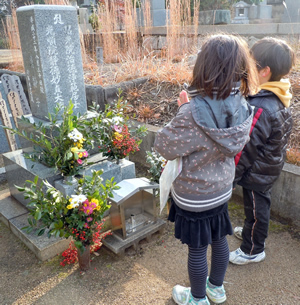 They never knew their great-grandfather, but their great-grandmother was a smiling presence in their lives until two years ago, when she passed away at the age of 97. To be honest, as time hurtles on, my own life has come to feel like a rusting barn, or fading gravestone. It’s funny how long my life seemed when I was in my teens and twenties, and how short I now find it from an older vantage point. Can it be another New Year already? Still, another New Year, as artificial as it might actually be, presents another opportunity for a fresh start, another chance to try again, to try harder. Friends, let’s make the most of that chance, in every pursuit that’s important to our lives, starting with the efforts we make, daily, to support our children’s bilingual development. P.S. If you felt a bit of inspiration from this post, just head to the Inspiration category for more of the same! How about you? Have you made a resolution of some kind for the year 2013? I love this!!! YES- I need to focus on their language development this year. We are in prime time for reading and writing, and I am going to really focus on developing these skills:). Previous post: Happy Holidays from Hiroshima!